My friends and I held an inaugural Chili Cook-Off in October and enjoyed it so much that we decided to make it a seasonal event. Thus the “Rock Out With Your Crock Out” was born. Today we’re holding Part Deux: Stew Challenge, and I’d like to share the recipe I made. 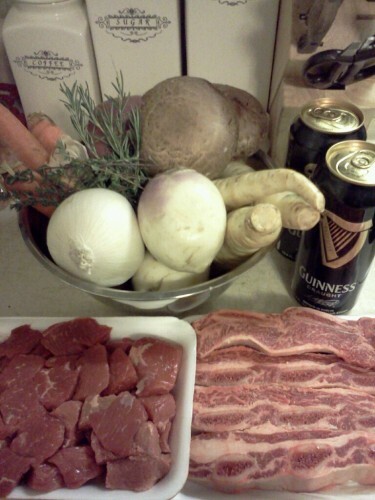 I call it Short & Stout Beef Stew for the short ribs and Guinness I used in the recipe. The recipe combines two cuts of beef, as the more cuts you use the more flavorful the stew. I used short ribs mainly for the catchy name, and a lot of the fat melted into the broth and needed to be strained (in my opinion). Consider using soup bones or beef neck to get that flavor without so much fat. I also used stew meat because it was cheaper, but because this isn’t a stew that cooks for 10 hours, you may want to consider using a brisket trimmed and cut into 2-inch pieces. This stew also builds flavor throughout each step. It sounds kind of putzy to “add this, set aside, rinse, and repeat” but that ensures flavor is layered throughout cooking time and really melds together. Because I made it last night for today’s competition, I didn’t get a chance to taste it, so I hope you enjoy. Heat oil in dutch oven. Toss meat with flour, salt, and pepper, and then brown in oil on all sides (3-5 minutes per side). Set aside. Place portabella mushrooms in dutch oven and saute until glossy, about 5 minutes. Remove and set aside. Place turnips, carrots, parsnips, potato, and onion in dutch oven and heat until onions are glossy, approximately 10 minutes. Add garlic and continue cooking 5 minutes, stirring occasionally. Remove and set aside. Return meat to pot and add beer. Bring to a boil and cook until liquid is reduced by half. Whisk water and soup mix in bowl and add to meat. Bring to boil, and then reduce heat to medium-low, cover, and simmer until meat is tender, about 1-2 hours. Remove short ribs and clean meat from bones. Shred and add back to pot along with veggies. Continue simmering on medium-low for 1 hour. Add mushrooms, thyme, and rosemary, heating through and letting herbs meld, approximately 20 minutes. Serve with a side of crusty bread. This entry was posted in Beef, CCC Updates, Main Dishes, Soups and tagged Beef Stew, Cooking with Beer, Guinness. Bookmark the permalink.